Restraining orders can come into play during divorce cases for any number of reasons, including domestic violence. 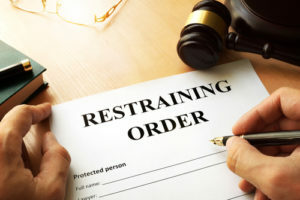 Restraining orders may be temporary or permanent, depending on a given case. If getting or dealing with restraining orders will be part of your divorce, you can turn to Scottsdale divorce attorney Karen A. Schoenau for experienced help and effective legal advocacy. While Karen Schoenau can help people efficiently secure restraining orders as part of a divorce, she is also skilled at assisting people in modifying or terminating restraining orders while helping them successfully resolve their divorce case. In many divorce cases in Arizona, at the beginning of the case, it’s possible (and common) for preliminary injunctions to be issued by the family court. As a specific type of restraining order, preliminary injunctions for divorce are usually issued for both parties in the divorce, and they are typically temporary, only lasting until the final divorce decree has been issued by the court. Either partner from harassing the other partner. The selling off of marital or community property. Existing insurance policies from being terminated before the divorce has been finalized. Minor children from being taken out of Arizona and/or moved without court permission or the consent of the other parent. Can be obtained from a Superior Court, a City Court or the Justice of the Peace Court. Are free to apply for. Can be issued on the same day as the request for this type of restraining order (i.e., the Petition for Order of Protection). Are intended to keep an alleged abuser away from victims until further investigation into the matter can be conducted. Here, it’s also important to note that you should call 911 if you or your children are in any immediate danger related to domestic violence. Do you need help with restraining orders and divorce? If so, you can rely on Scottsdale divorce attorney Karen Schoenau for experienced, effective help and legal representation. Since 1987, Karen Schoenau has been committed to helping people resolve their important and sensitive family law matters, including complicated divorce cases involving domestic violence allegations. Work closely with each of her clients to help them understand their best options for resolving their divorce and other family law issues. Keep them informed about the progress of their case. Help them get through the emotional and psychological impacts related to their divorce and other family legal issues. Help them successfully resolve their divorce. To learn more about how Scottsdale divorce attorney Karen Schoenau can help you, schedule an initial consultation with her today by calling 480-467-3435 or by emailing us using the contact form. From her offices based in Scottsdale, Attorney Karen Schoenau represents clients throughout the metropolitan Phoenix area and the state of Arizona, including Scottsdale, Mesa, Surprise, Maricopa County, Pinal County, and Gila County. Karen was extremely helpful setting up my petition for conciliation. She was very knowledgeable and responsive to my questions and requests. She is trustworthy and diligent. I would recommend her to anyone having marital issues. Karen was extremely supportive during a very trying time in our lives. She helped me to put things in perspective and think positive when I was overwhelmed. Karen is highly respected in the legal community. She is effective and thorough. Karen just keeps going regardless of the odds. Karen’s easygoing manner and her knowledge really helped me with the emotional part of my divorce. I used the team of Karen and Bonita both times I needed to go to court with my ex and had results that were best for my little girl. © 2019 Law Office of Karen A. Schoenau.